I love to make sure that Ed has a good breakfast in the morning during the week WITHOUT me having to cook every single morning. These sorts of meals are great to make a head and simply reheat the portion you want when you are ready to eat it. Filling, yummy, and easy. It doesn't get much better than that! Preheat oven to 375. Spray 9x13 dish with pan spray. Mix the milk and jiffy mix together, spread as evenly as possible on the bottom of the pan. Sprinkle with cheese. Top with ham, then pour eggs over the top. Bake for 30 minutes or until cooked through. This looks delicious and so easy to do. We are huge egg fans here! Thank you! Sounds yummy! and even I could make that without messing it up!! I'm a horrible cook... but I LOVE to eat. I'm great at pushing the microwave buttons. It's a talent! I LOVE breakfast casseroles! 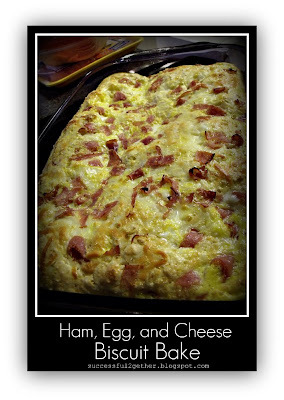 This would make a great brunch idea with some fruit.... Definitely bookmarking to try soon. So simple and yummy! And I always have these ingredients on hand! No more McyD's breakfast for me! Oh yum. I'm going to add this one to my recipe box. Thanks for stopping by Feeding Four. I'm your newest follower. looks really delicious and easy to make! thanks for sharing! Google Friend Connect Going Away? *New* Successful Saturday Link up!!! Fun with Wontons! Three New Recipes!